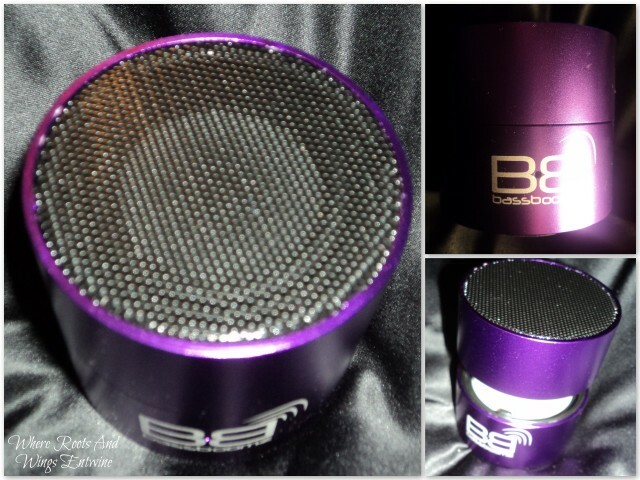 Where Roots And Wings Entwine: BassBuds BassBoomz speaker review. When we previously reviewed a pair of BassBuds headphones both Lee and I loved them (we still do); we both love the gorgeous silky white colour of the headphones, the sparkly Swarovski crystals that glisten on the outside of the each ear-bud, the quality of the headphones and the impressive crystal clear sound that the headphones deliver. 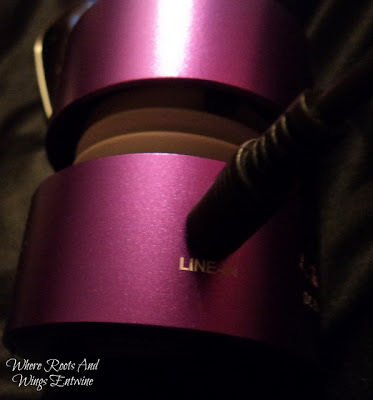 As we both love the headphones and have to fight over who gets to use them we were both excited when we were given the opportunity to review another product from BassBuds, a BassBoomz speaker. According to BassBuds the BassBoomz is a high performance portable Bluetooth speaker that is described as being “portable, powerful and practical” boasting that it is “small in size, big on sound”. * Portable and pocket-sized for your music on-the-go. Statistics from the BassBoomz page on the BassBuds website. When Mr.Postman delivered a small parcel from BassBuds I felt like a little child at Christmas, excited and eager to open the parcel so that I could take a look at the speaker and put the BassBoomz to the test. I instantly loved the speaker’s shiny appearance and gorgeous, vibrant colour that is truly striking. The speaker is funky in design and is a great compact size, measuring only 5.5cm wide, and 6.7cm in height when in an open position and 5.2cm in height in the closed position. When not in use the speaker can be closed by pressing the top and bottom of the unit together and twisting the top of the unit clockwise to lock the speaker closed, when in use the speaker is opened into an expanded position. At the rear of the speaker there is a line-in dock for the audio cable, a DC 5V charging jack port and an on/off power switch. The BassBoomz has 3 rubbery feet on the base to help provide stability and according to the facts on the box this design feature is incorporated to help “reduce interference” and provide “vibration dampening when used on hard surfaces”. Even though I love the little speaker’s design and gorgeous colour, looks alone would not be enough to blow me away…..I wanted this stylish speaker to also deliver on providing a great sound and be simple to use. I hoped that the speaker would not require a technological wizard to operate it, being easy enough for me to use it without Lee’s help. To see whether I could master using it by myself I decided to give it a whirl before Lee got his hands on it. As I was keen to listen to some music and see whether the speaker was really “big on sound” I decided to first try the speaker using the 3.5mm audio cable. 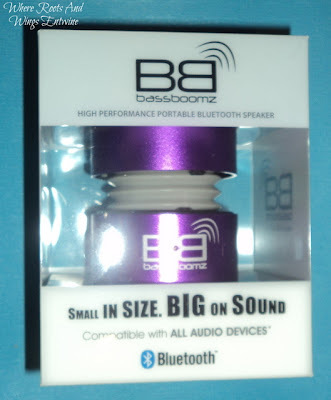 It is easy to listen to music on the BassBoomz speaker using the audio cable; you simply plug the cable into the line-out or headphone jack of your audio, plug the other end of the cable into the line-in on the speaker unit, turn the speaker on and start playing music on your audio device. The audio cable works perfectly to play music from my smartphone, MP3 player and laptop on the speaker. I think that it is great that the speaker is supplied with an audio cable and the option of playing music via the audio cable means the speaker supports all devices that have an audio jack output which means the speaker is compatible with a number of audio devices. As well as being able to play music on the speaker using the audio cable, the speaker’s clever technology allows you to listen to music from a number of Bluetooth enabled music devices on the BassBoomz speaker using Bluetooth technology. I was surprised how simple it was to connect the speaker to an audio device using Bluetooth to listen to music; you simply turn the speaker on using the power on/off swtich, turn on the Bluetooth on your audio device, search for devices and choose the ‘BassBoomz’ device to pair with (when you pair your audio device with the BassBoomz for the first time you need to input password ‘0000’ to pair the device with the speaker, after the first time the speaker will automatically pair with the audio device). 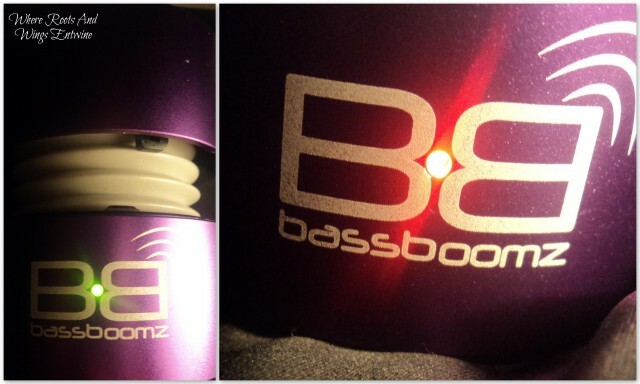 In the centre of the BassBoomz logo on the unit when the speaker is in use a green light glows steady. When the battery is low on the speaker the LED light will flash. To charge the speaker’s battery use the USB charger cable that comes with the speaker; when charging the speaker the LED light glows red to indicate charging and once the battery is fully charged the light turns off. The speaker comes with a built-in high performance Li-on rechargeable battery which battery charges in 1.5 hours. We have found the battery performance to be good with the battery lasting on average 5 hours from full charge which seems to be about right as it states on the box that the speaker’s battery will last “5-6 hours at 70% volume”. Even though it is an impressive description I honestly doubted that this tiny speaker would provide a decent, quality sound but as soon as I played music using the speaker my doubts vanished. Both Lee and I are impressed with the powerful sound the speaker produces and agree with BassBuds’ description of the speaker being “small on size, big on sound”. We were both surprised by the sound quality that this tiny speaker produces and think it is amazing that even though the speaker is small it is full of sound. Lee describes the speaker as producing a balanced, smooth, crystal clear sound; with a great sounding treble and an impressive bass blasting from the tiny unit. Both of us love the innovative twist and release bass expansion system, not only does it allow the speaker to produce an remarkable bass sound but it also give the speaker a funky, unusual appearance. We have both used the speaker with various audio devices and with different sounds and music genres, and have been very impressed with how the speaker has handled all types of sounds and audio devices. As well as using the speaker with our smartphones (using both the audio cable and Bluetooth technology) we have also used the speaker with our laptop to listen to music and to watch films. The speaker has been flawless and easy to use with a variety of audio devices, producing fantastic sound every time. Unlike the majority of speakers the BassBoomz has no on-board volume dial; instead the volume of sound that the speaker produces is controlled by the device playing the sound. When playing music I have found I need to adjust the volume depending on the genre of music being played but that can be true when using any devices (speakers or headphones) to listen to music. Even though we both have been surprised with the sound that the small speaker produces Lee loves listening to music at a LOUD volume and he would love it if the speaker sound was even louder. As Lee would love the sound levels to be louder with an even bigger impact he loves the idea of getting extra sound impact with the speakers dual connectivity and he would love to have another speaker to connect 2 speakers and test out the sound impact they can produce together. Both Lee and I have been very impressed with both the design and sound of the speaker. We both think the BassBoomz is a wonderful gadget, it is an innovative, clever device that is packed full of technology to produce amazing sound. Not only have Lee and I been captivated with the speaker but little man has also been mesmerized and very intrigued by the small speaker, enjoying dancing to music blasting from the unit. Not only does the speaker perform to a very high standard, producing a superb sound but it also looks fantastic. I love the gorgeous colour and its quirky style. The speaker is well made using high quality materials; its solid aluminium constriction looks and feels durable, solid and sturdy. The speaker is a great compact size, perfect for popping in your bag when going out so that you have the speaker to hand whenever and wherever the desire to listen to music hits. Unlike the BassBuds headphones the speaker does not come with a protective/storage bag; even though this is not a big issue as the speaker can be closed when not in use which protects the speaker from damage I think it would be nice to have a protective bag to store the speaker in for added protection and safekeeping, protecting the gorgeous speaker and its stunning colour from scratches and damage. 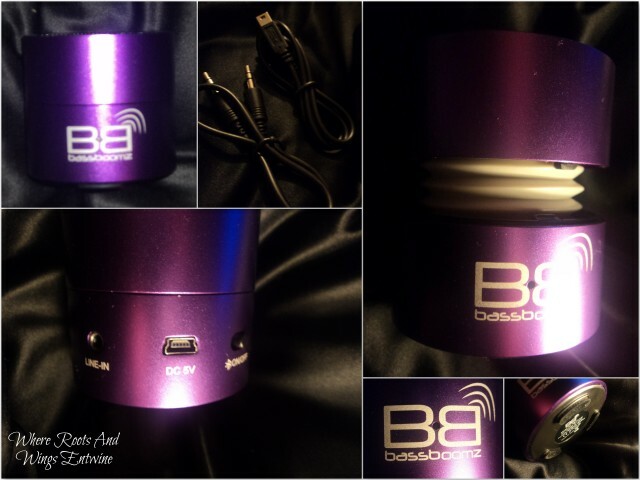 The BassBoomz high performance, portable speaker can be bought on the BassBuds website for £79.95. Even though the price is a tad expensive I think the speaker is worth that price as it is an innovative, high quality speaker that boasts impressive technology in a small package allowing users to experience superior sound quality. I think the speaker gets bonus points for the fact that it is compatible with a variety of audio devices including smartphones, laptops, tablets and MP3 players thanks to the option of using either Bluetooth technology or an audio cable. 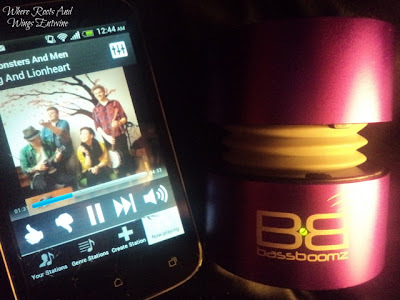 I would highly recommend BassBoomz; it is an exciting little speaker with many notable features. We have already made great use of the speaker and I foresee the speaker being used heavily for a very long time. I am already looking forward to using the speaker in the summer if and when we have some lovely weather….I can picture music dancing out of the speaker as we enjoy summer days and nights sitting in the garden enjoying lovely weather and a few tasty BBQ’s, with little man playing outdoors and dancing to the music as we all relish the weather and pleasing music filling the air. 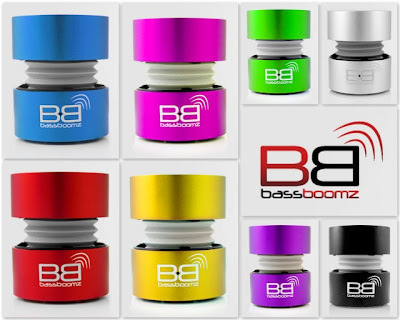 With its stunning design, dazzling colour, high quality construction, impressive sound, versatility and compatibility with various devices the BassBoomz is a high performance, impressive portable speaker that is perfect for music lovers. More information about BassBuds and BassBoomz.